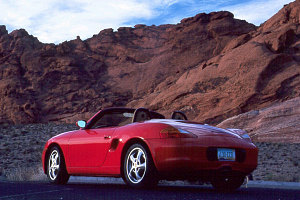 This image gallery documents a little bit of automotive fun that Luke and I had, at the tail-end of our May 2000 desert trip (you can read about that trip, along with images, here). 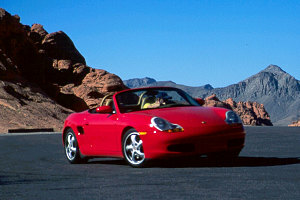 We spent one last day in Las Vegas before heading back home, and we rented a 2000 Porsche Boxster from a 'specialty' car rental place in town (and there are many such specialty rental places in LV, let me tell you!). 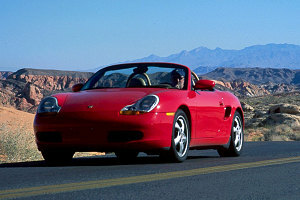 We were hoping to rent a more powerful Boxster S, but they were out at the time. 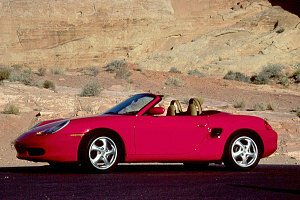 It was pricey, but we only rented for a day. The free mileage limit was only 100 miles, too, and things started to get really expensive if you piled on the extra miles. So, we tried to focus on the best nearby twisty roads we could find. 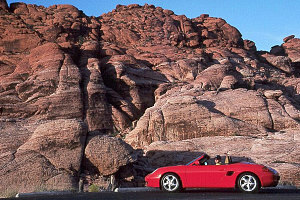 The first stop was Red Rocks State Park, a little ways west of Las Vegas. A very pretty place with a fun loop road. 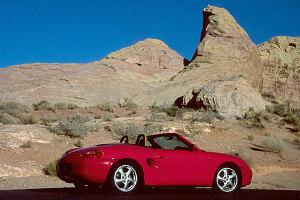 Next, we headed over to Valley of Fire State Park, northeast of Las Vegas. This was a little farther to reach, but there is a fantastic dead-end spur road in the park that was perfect for us: beautifully paved, very deserted (we were there very early in the AM), and very twisty. Oh, and very scenic, too. I think a lot of car companies come here to shoot promo videos.